Upcoming hard-punching prospect, WBC#3 Daigo Higa, 111.75, impressively kept his OPBF flyweight belt as he extended his unblemished mark to 11-0, 11 KOs by finishing game Filipino southpaw Felipe Cagubcob, Jr. (6-3-5, 2 KOs), 112, at 2:55 of the fourth session on Saturday in Tokyo, Japan. 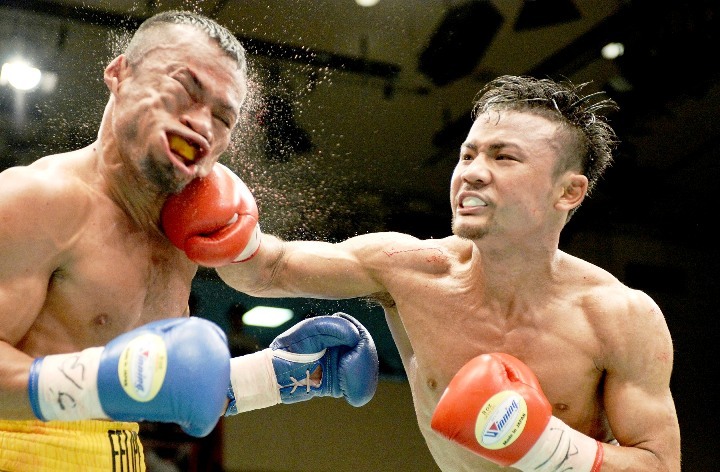 The 21-year-old Higa, handled by ex-WBA 108-pound champ Yoko Gushiken who scored thirteen defenses, overwhelmed the Filipino from the outset, battering him from pillar to post. But Cagubcob fought back hard by trading strong body shots each other, but Higa’s acceleration of attack visibly weakened him in the third. The fatal fourth witnessed Higa connect with solid combinations, dropping him twice and for the count. Gushiken said, “Higa is strongly than I when I was twenty-one.” Higa also said, “I strongly wish to tie my manager’s record of winning the world belt at the age of 21, and I believe I can.” But Higa, while young, had better learn and improve how to defend himself from the great champ.